"Srila Bhaktivinoda Thakura has sung, krsna se tomara, krsna dite para, tomara sakati ache. 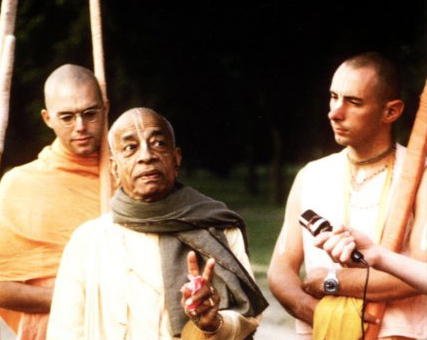 In this song, Bhaktivinoda Thakura describes that a pure Vaisnava, as the proprietor of Krsna and love of Krsna, can deliver both to anyone and everyone he likes. Therefore to get Krsna and love of Krsna one must seek the mercy of pure devotees. Srila Visvanatha Cakravarti Thakura also says, yasya prasadad bhagavata-prasado yasyaprasadan na gatih kuto'pi: 'By the mercy of the spiritual master one is benedicted by the mercy of Krsna. Without the grace of the spiritual master one cannot make any advancement.' By the grace of a Vaisnava or bona fide spiritual master one can get both love of Godhead, Krsna, and Krsna Himself."